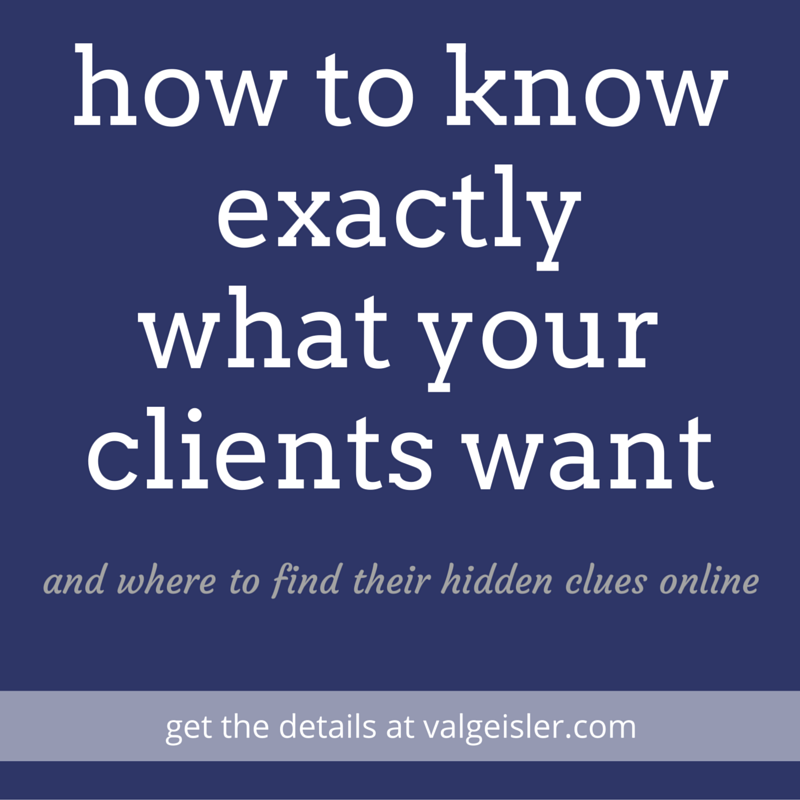 So you wanna know my secret to knowing exactly what my clients need from me each and every time I launch a new product, service, or workshop? Well, if you’ve been reading my blog for a while, you know that I really can’t keep my secrets, well, secret. In fact, MOST of my blog posts revolve around revealing the secret to how I make my business hum and exactly how I teach my 1×1 clients to do the same for theirs. Hey, it’s hard enough when you’re running a business without all the mystery behind making it actually run. Why not spread the love?! Are you just dying to know already? When I shared these two sites with Suzi as we built out the content of Your Signature Experience, she was completely floored. Every time I use these sites in our Charismatic Brand Strategy Reports, the content I find in them is what shapes the details those clients use every day in their wildly successful businesses. These two sites are GOLD freakin’ MINES. So what are the sites already? Wait, what?!!?!? << That’s you, right? Bloggers have blog comments, YouTubers have YouTube comments. And if you think blog readers have a lot to say in their commenting, they have nothing on YouTube Subscribers. YouTube commenters are saying exactly what they wish the video had (or even what they luuuuurved about it). Comments like “This went by too fast!” or “The first 4 minutes were great but I don’t have time for a long 20 minute video about raising healthy kids” tell you how long to make your content if you’re producing courses or programs. Whereas comments such as “I’d love your opinion on if the likes/dislike buttons being made private or public makes a difference in views” and “What sources do you recommend for finding good music?” give you your next blog, vlog, or webinar topic. Find the accounts of businesses who share your ideal client and dig through those comments. Grab screenshots, start a Google Doc, or drop ‘em in your Evernote files. Save these gems to build the content your potential customers are craving. So this one is a bigger answer than one word. After all, I’m not telling you to go see what those ideal clients are shopping for on Amazon (at least not yet…. I will if you join us for Your Signature Experience!). In Amazon you’ll want to head to those books that your ideal customers rave about. You’ve probably seen them in Facebook Groups or on Instagram or maybe you’ve even talked to a few of your customers and they’ve mentioned a favorite book here or there. So go to those books and hit the button for the 3 star reviews. Why 3-star? Because 5-star reviews are either a) paid for or b) totally biased and not incredibly useful in this case. 4-star are nice if there aren’t any 3-star. But let’s aim for 3. In those 3 star reviews, you’re looking for those same gems as you found on YouTube. The “This book was missing an entire chapter about ______.” or “It was good to read but pretty basic, I want something with more evidence based research behind it.” << those are your magic bits. Take them and fill in the gaps. See the goal here? You’re looking for what isn’t already out there. If all you do is repeat what everyone else is saying, you can’t stand out and create your own signature brand experience.